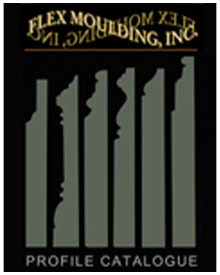 Our Moulding Profile Catalogue is conveniently available for customers. 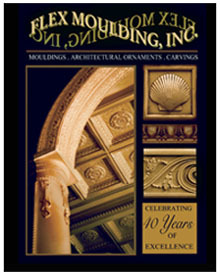 This catalog shows complete profiles of all stock mouldings. New mouldings are constantly being added to the line. Any of these mouldings can be cast into radius or free curve to your order. Flex Moulding can also be supplied as preformed arches to your specifications. We can reproduce any item you may wish to have copied. Printed catalogues are available at a cost of $15.95 which will be credited to your order of $100 or more. All catalgoues are available through our online store. After years of research, our company created the architects’ and designers’ dream. Our flex moulding products are so flexible that they can conform to virtually any curve or turn. The flex moulding offers all the advantages of wood at a fraction of its cost. Our flex moulding is recommended for home restoration and has a variety of uses including trim for kitchen cabinets and fireplace mantels, use on columns and sconces, and for use on decorative items such as frames, wall mirrors, and lamp bases. This product can be made in fire retardant or fire-proof formulations and can be manufactured in several grades from very flexible to fully rigid depending on use. Printed catalogues are available at a cost of $15.95 which will be credited to your order of $100 or more. All catalgoues are available through our online store.